“God bless this mess,” sings Sheryl Crow at the beginning of her new album, Detours– and it’s hard to imagine a more fitting sentiment to summarize these fourteen new songs. Nothing if not ambitious, Detours lives up to its name, finding the nine-time Grammy winner veering off on to as many strange tangents and surreal side roads as an adult pop album like this one can afford. The result is an unfocused, sprawling trainwreck of an album that tries anything and everything, and fails more often than not; as frustrating as it can be, though, it’s never unlikable, and in fact, its tossed-off eclecticism and its acute sense of ADD make it a compelling and even admirable album, if not anything close to a great one. So strange and so schizophrenic is this record that it’s difficult to know where to begin. The record is neatly divided into roughly two halves– the first half comprised of sleek, upbeat, radio-ready pop songs, the back half made up of more introspective, pensive acoustic songs. It’s not unlike the electric-acoustic dichotomy of Dylan’s Bringing it All Back Home, though the material obviously isn’t nearly as timeless an artful, and Crow’s popstar and singer-songwriter roles don’t seem as closely linked as the different facets of Bob Dylan. The first half is the bolder and brighter of the two, and it’s both the most exciting and the most maddening. Crow doesn’t do guitar rock so much as she does slick, mainstream pop; it works well on the lumbering arena rock of “Shine Over Babylon,” but not as well on the lighter, more carefree numbers like “Love is Free” and “Peace Be Upon Us,” which quickly wear out their welcome with their irritatingly repetitive hooks and cheesy handclap percussion. This is the part of the album in which Crow tries to do the most, and thus it is both charming in its ambition and frustrating in its overreach. It’s also the funniest half of the album, and also the one with the weightiest concerns– in case the song titles didn’t give it away, this is where Crow comes out as a protest singer, spinning socially- and environmentally-aware anthems that alternate between sly humor and cumbersome platitudes, like her oh-so-ironic quoting of the Sermon on the Mount as a political bludgeon in “Peace Be Upon Us.” She also falls into the same trap as so many other grown-up protest singers, inviting a Middle Eastern singer to duet with her on one song and adding some vaguely ethnic production flourishes in others, as if such tricks lend a sense of global awareness to these songs. If she’s in protest-pop mode on the album’s front half, she dips into autobiographical folkie territory on the back half, which means the last stretch of songs is more ernest, more focused, and less cluttered, but perhaps a bit less interesting, too. She writes a few pained kiss-offs to ex-fiance Lance Armstrong, as well as a tender lullaby for her adopted son, and the arrangements are much less polished and much more tasetful here, so much that you can actually hear the cracks in her voice on the wrenching “Diamond Ring.” She does this kind of thing well– and frankly, she and producer Bill Botrell don’t muck things up nearly as much here, if nonly because they don’t bite off quite so much– but, after the headache-inducing noise of the album’s first half, it almost seems anticlimactic at times– a little less ambitious, a little less interesting. 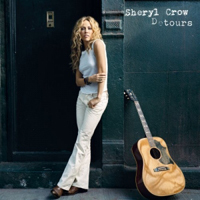 It would’ve been a much stronger record if the two sides of Sheryl Crow had been allowed to intermingle– if the folky numbers were used to give a bit of relief and contrast to the shiny pop songs, rather than being tucked away all in a row at the album’s end. Come to think of it, the album suffers a bit from what seems like a lack of confidence in the material– do we really need so many gimmicky production flourishes to make these songs interesting? One suspects that, in the hands of the right producer, Crow’s material could be pretty strong. As it is, Detours is muddled and mucked up, often difficult to really like, but also difficult not to appreciate, at least for its sprawl and its overreach, if not for its execution.